With the Harry Potter and Twilight sagas finishing, desperate for a new teen-friendly franchise, Hollywood served up The Hunger Games. The film adaptation stars Jennifer Lawrence, Josh Hutcherson, Liam Hemsworth, Elizabeth Banks and Woody Harrelson. 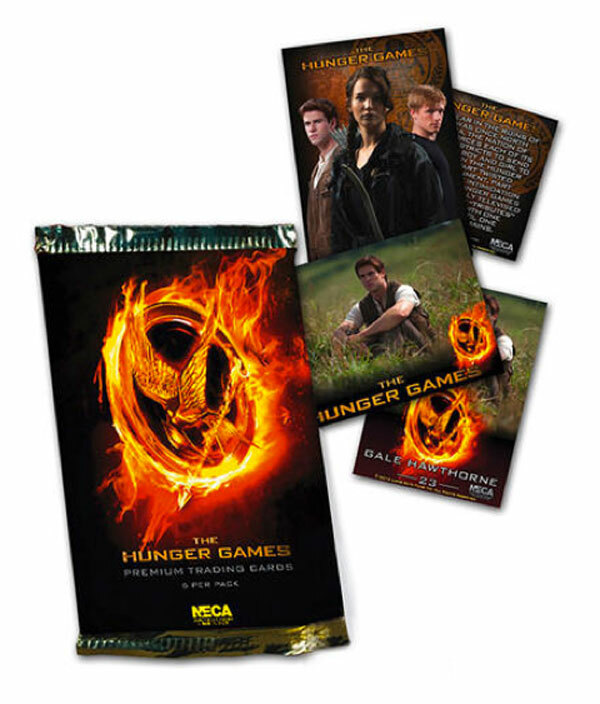 2012 NECA The Hunger Games Trading Cards captures the film with a straight-forward release that doesn't have any inserts. The closest thing is a nine-card puzzle that is a part of the 72-card base set. While there are no autographs, memorabilia cards or other hits, properties like these often bring in people who might not usually collect cards. It happened with the original Twilight set from Inkworks. At one point, people were paying several dollars for common cards of the main characters and base sets were going for upwards of $100. While prices should be more stable here, there is the potential for it to break out with non-collectors. With so much action and unique costumes, the movie offers plenty of content possibilities, even for a straightforward base set. The Hunger Games is the first of a three-book series by Suzanne Collins. They tell of a grim future where groups of young people battle it out every year in a publicly televised fight to the death. In the past, NECA has made standalone sets for such films as Napoleon Dynamite, The Nightmare Before Christmas and the Twilight series. 72-card base set recaps the film, which is based on the best-selling book by Suzanne Collins. Base set breaks down as follows: title card, 17 character cards, 44 story cards, nine puzzle cards and a checklist. THE HUNGER GAMES PREMIUM TRADING CARDS 10-BOX CASE - CLOSEOUT DEAL!!! THE HUNGER GAMES CATCHING FIRE TRADING CARDS 10-BOX CASE - CLOSEOUT DEAL!! I received a few of these NECA packs at the Wal-Mart midnight release of the Hunger Games DVD and in one I have a card of “Foxface” which has a signature in what seems to be silver sharpie by Jacqueline Emerson. Unlike every other card I saw in the eight packs I opened it was not numbered as a card in the set, but on the back there is a place where it says “A6”. I assumed this to mean the 6th autographed one by Jacqueline. Also on the back there is a faint faded outline of a second signature which I believe to be the ink from the “A5” card which rubbed onto it when placed on top if it. However this article and another have read that there are no autograph cards.